Fantastic set up, huge pens so cats have more than enough room and the owners are lovely people. What more do you need! Buddy had a lovely time. Sally was fantastic very warm and welcoming and her care of mums cat was second to none. I can't recommend this cattery enough. ​Super cattery, lovely people - I even had a text on Christmas Day to let me know my precious Percy was ok. Would 100% recommend and will definitely use again. Luna stayed with Sally for 4 nights from 2nd May. The hotel is spotless and unbelievably well equipped. Luna is only 10 months old so it was her first stay away from home, she was very well looked after and it certainly won't be her last stay! My cat Parsley has recently spent 10 days here - what a fabulous place in a beautiful setting! Very luxurious, spotlessly clean and Sally clearly loves & cares for all the cats whilst they are in her care. She kindly sent me updates & pictures of Parsley during my holiday so I knew he was OK. I wouldn't hesitate to recommend Willow Tree Cat Hotel. Thank-you Sally for looking after Parsley. ​Had our two beauties Millie and coco stay here last week, can't thank Sally enough she is amazing and our babies were so well looked after and we were kept up to date all week and had photos sent to us. ​Just collected my cat Timmy after a short weekend break first time for him Sally immediately made him and us feel at ease, the place was spotless and the pens very welcoming equipped with fluffy blankets, cushions and toys which Timmy loved. I would not hesitate to recommend Willow Tree Cat Hotel and Sally's care. ​My two cats stayed here earlier on the year, we have since moved house and are unable to send them here anymore but if you are in the Shropshire area I would not send my cats anywhere else. Beautiful facilities and lovely people. Felt completely comfortable leaving them there. ​Modern, clean and quiet. My wife & I would stay here ourselves if we could! Its fantastic! ​Best cattery I've used. Facilities are fab, definitely a cat hotel. The text updates to let me know my cats are happy are fab. Would definitely recommend to anyone who needs a temporary home for their cats. ​This is the very best of care and comfort. Sally is so welcoming and considerate and my 3 cats were so well looked after. Sally even looked after my horse trailer whilst we moved house! thank you.... I am certainly going to use you again and would highly recommend. ​Yanni stayed at Willow Tree in September and I cannot fault the care she had or the time Sally gave to making sure I was reassured that she was ok. Willow Tree is very special - every effort is made to make your cat feel at home and Sally's obvious love of cats is very evident. Many thanks and it wont be long before we see you again! Most amazing place for cats to stay! Such a lovely environment and such lovely owners! I would highly recommend to anyone! Really is a great place! ​Immaculate and super comfortable environment for cats! Always very clean and has everything your cats will need for a lovely stay away. My two absolutely love it here. Sarah Upton-Atherton recommends Willow Tree Cat Hotel. ​We have used willow tree cat hotel twice now for Zeus and each time he always comes away happy, he loves it there, we also have a lovely holiday knowing that he’s well looked after and in safe hands. We get pictures through and updates which is a lovely touch. I wouldn’t use anyone else. Thank you Sally again for looking after Zeus so well. 03 October 2018 Keeping your cat safe, comfortable, well fed, entertained and relaxed while you're away. Sally runs a top notch establishment it's well worth the drive to discover. 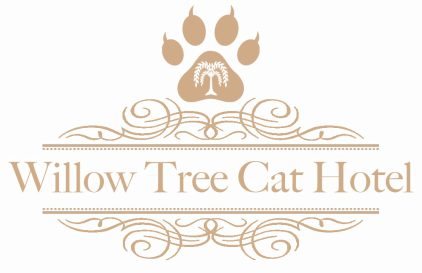 ​Willow Tree is a luxury cat hotel in every sense. Instantly it is obvious it has been designed firstly for the comfort of its "guests" and secondly with no expense spared. I have a very "scaredy" cat, but Sally naturally knew how to treat him and she then sent photos every couple of a days to prove how at home he had become. I wouldn't consider anywhere else now when Felix needs a holiday.